BEIJING (CN) - With 418 exhibitors from 23 countries and 12,470 visitors, the 9th AchemAsia closed its doors on Thursday in Beijing. For the first time, more than 50 % of the exhibitors came from the PR China. "This is partly due to the fact that more and more international companies are represented by regional subsidiaries", explained Dr. Thomas Scheuring, CEO of the DECHEMA Ausstellungs-GmbH. "But it gives also proof to the fact that AchemAsia is firmly established within the Chinese industry." The atmosphere among the exhibitors was also positive. The high number of visitors - exactly at the same level as at the last event in 2010 - was reflected by many intensive discussions and new contacts made at the stands. The new conferences layout was especially well received. The satellite symposia that had been organized by Chinese and international partners were mostly filled to capacity, sometimes the number of seats was not sufficient to accommodate all interested persons. "Our Chinese partners in particular, and notably our co-organizer CIESC - Chemical Industry and Engineering Society of China, have picked highly up-to-date topics", said Prof. Dr. Kurt Wagemann, Executive Director of DECHEMA e.V. Among these were resources for the substitution of petroleum, environmental technology, water treatment, and separation technologies. Other events and the exhibitors' presentation also received very positive feedback. In his speech at the opening ceremony on May 13th, 2013, Prof. Li Yongwu, Chairman of the China Petroleum and Chemical Industry Association and President of the Chemical Industry and Engineering Society of China (CIESC) emphasized the importance of AchemAsia for international cooperation. He also pointed out the necessity of a sustainable industry with a focus on energy efficiency and recycling. In the press conference Prof. Yang Yuan Yi, Chairman and Vice President of CIESC, highlighted the progress China's industry has already achieved on the route towards sustainability. The Zhenhai refinery, for example, is one of the most energy-efficient facilities worldwide. Regarding fuels, there is not only a trend towards sulphur-reduced conventional gasoline, China is also researching biofuels. The first flight of China Eastern Airlines with bio-kerosine took place by the end of April this year. And several coal power plants have been fitted with plants for carbon capture and storage (CCS). The fact that China is actively addressing its environmental challenges became also apparent in the exhibition. Apart from process technology, plant engineering and pharmaceutical technology, many companies offering environmental technology and water treatment were present. Food processing, agrochemistry and biotechnology were also important topics, indicating the increasing importance of the life sciences sector. Overall, 418 exhibitors from 23 countries displayed their offerings on 6,500 m². After China with 240 exhibitors, the largest groups came from Germany (90) and France (17). 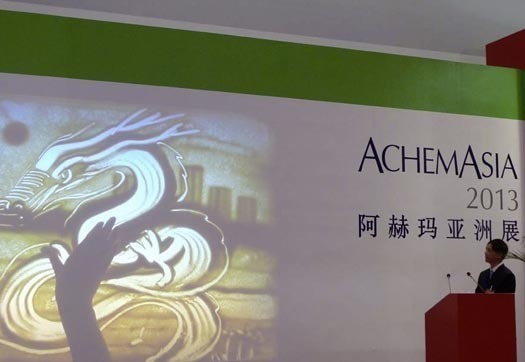 AchemAsia takes place every three years in Beijing/PR China. It is organized by DECHEMA and CIESC (Chemical Industry and Engineering Society of China) in cooperation with numerous Chinese and international partners.